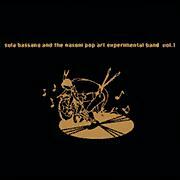 It's time to go back to the 1960s and have a trip with Sula Bassana and friends from Johnson Noise and Weltramstaunen. The CD opens with "Slowner", which features a great organ riff and a cool heavy guitar riff but still very 60s in the feel. The instrumental track, "Terrascrew", is very much like Mandra Gora Lightshow Society, especially with that guitar sound that Wilhem masters so well from the late 60's. Killer track. "Ridin'" is a spacey little number as well. "Go!" is a 9 minute track with a great bass line and cool delay guitar that slowly develops into a very happy song. Not many vocals on this one after the beginning. The mood changes drastically with the slightly middle eastern tinged guitar and dark sober mood of the track. Really nice stuff. "Pay for Freedom" follows and we head back to that nice 60's sound with some spaced out guitar and vocals on this fast paced track that is one of the most psychedelic, as a whirlwind of far out sounds swirls in the background under a simple guitar riff. "Daydream" takes things down again and features a fantastic psychedelic mix as the guitar floats around the soundscape. Cool stuff. The CD ends with "Emmerting Spring", the longest track on the CD and begins with a long 3 minute freak out of sounds before slowly building up with guitars, bass and drums, looped in some way, to create a cool atmosphere. Great record.